Lake Monsters Robotics is a group of students and mentors who love what they do: creating technological works of art, fueled by the passion of creative engineers. Comprised of students from Lakeridge and Lake Oswego High Schools, the team builds robots to compete in the international FIRST Robotics Competition (FRC). Learn more about FRC. Now in its ninth year, Lake Monsters Robotics was formed in 2008 by Matt Price and Sarah Alt-Price, both physics teachers at Lakeridge High School. The Prices coached the team through the 2011 season. Since the 2012 season, the Lake Monsters have been a volunteer- and student-led program. The team coach for the 2012 season was Mike Rode, a mechanical engineer from Hewlett Packard. The 2013-2014 season team coach was Stacey Lee, an engineering project manager at Veris Industries. In the 2015 season, Owen Griffiths, a physics teacher at Lake Oswego High School, joined the Lake Monsters as team coach and faculty advisor. Lake Monsters team membership has remained consistent with 15 to 20 students each season. A dedicated core group of six to nine engineers, programmers, and machinists have enthusiastically mentored the team each season. For the 2015 season, the team has 35 student members and 10 mentors. 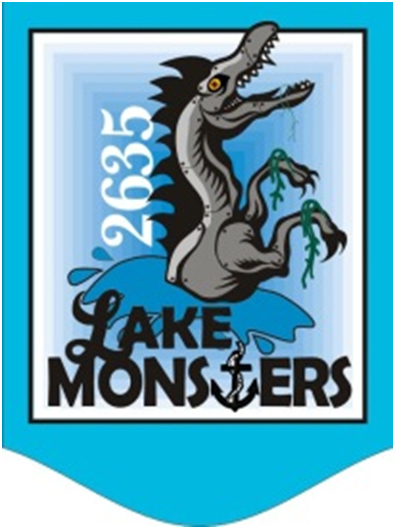 Since 2011, the Lake Monsters Robotics lab has been located in a dedicated shop room at Lakeridge High School (for the first three years, the team worked in a shop space donated by mentor Gary McKenzie, owner of RAPID4mation). The team serves Lakeridge and Lake Oswego high schools, providing an opportunity for all high school students in the district to learn about engineering. With state funding cuts, programs like shop have been eliminated from the Lake Oswego School District curriculum. Within its first two years, the Lake Monsters team increased interest in STEM programs at the high school level. The school board now offers a class in Principles of Engineering, which is a FIRST step to bringing more hands on applied sciences back to the district. This small, but enthusiastic team won the 2009 Oregon Regionals. In 2014, the team received the Judges award at the Pacific NW district event at Oregon City High School. In 2015, the team received the Entrepreneurship award at the Pacific NW district event at Oregon City High School. The Lake Monsters won the 2015 Pacific NW district event at Wilsonville and placed first in qualification rounds. The team also received the Industrial Design award.